From the kitchen of One Perfect Bite...It's official, and, for good or ill, there are now 1000 posts and recipes on One Perfect Bite. It's a milestone I never dreamed we'd reach, but it has happened and it looks like we're still going strong. The number really surprised me because it's one I don't track. Were it not for a congratulatory reminder, I'd have missed my own party. That means I have no great plans or mind bending recipes to share with you tonight. Just small thoughts and a tiny treasure of a recipe that I hope you'll find appealing. While plans for the next few months include a minor face lift for my aging "baby" and the creation of an indexed recipe collection, there will be no major changes to One Perfect Bite. I want to stay on this platform for another year and keep what I say and do here as conversational and informal as I possibly can. I continue to resist the impulse to become "professional" . Were there a category for a voice like mine I'd jump at the chance, but the sheer number and volume of professionals vying for your ears would mute mine and force a type of conformity that would change the nature of One Perfect Bite. I don't want that to happen, so, change here will be a very gradual thing. Today's feature uses exactly 3 ingredients. 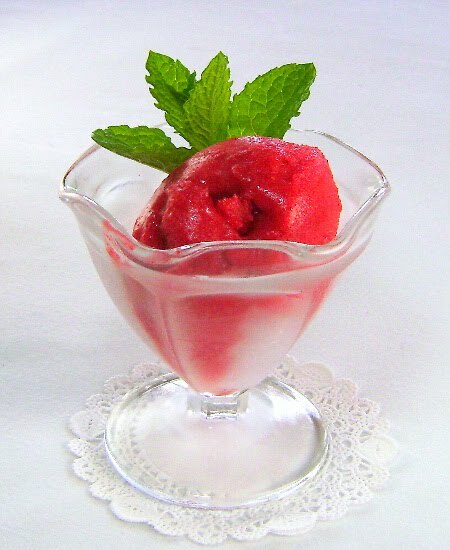 It's a recipe for strawberry sorbet that was developed by Family Circle magazine. I really like this recipe because it can be made without an ice cream maker. It's really easy to do, but its taste is completely dependent on the flavor of the berries you use. This sorbet will make your socks go up and down - and curl your toes - when it is made with small field ripend berries. I know you'll like it. Here's the recipe. 1) In a medium-size heavy-bottom saucepan, stir together 3/4 cup water and sugar. Bring to a boil over medium-high heat. Boil for 1 minute. Turn off heat and stir until sugar is dissolved. Allow to cool. 2) In a food processor, puree strawberries with soda. Add sugar syrup and process until combined. Pour into a 13 x 9 x 2-inch metal baking pan and freeze for 4 to 4-1/2 hours, until frozen solid. 3) Scrape into a food processor and process briefly until smooth but not melted. Spoon back into metal pan and freeze for an additional 1 to 2 hours before serving. 4) Form into balls with an ice cream scoop; serve in dessert dishes and garnish with mint leaves if desired. Yield: 6 cups. Mary congratulations!!! 1000 posts...that is dedication...The sorbet looks great! Congratulations is in order here....1000 posts and recipes! That's a great achievement indeed...you post so regularly I find it hard to catch up! The sorbet will cool us down some with the hot weather still prevailing over here! Congratulations on 1000 posts! You have such a beautiful blog. You are an inspiration! What a colorful and refreshing recipe to celebrate the 1000th post, Mary! Congratulations! Keep up your enthusiasm,you're an inspiration to us!Have a great day! What an incredible achievement! Congratulations! I am looking forward to the next 1000. That is some milestone indeed! Well done! I have about half of that number in terms of posts. What a great recipe resource this blog is! Congratulations! That truly is incredible! Congratulations! 100o posts is an incredible collection of recipes, it will take you ages to make an index!! Nice to have a 'face lift' now and then, but keep the spirit of your blog, please! And going professional should not change that either, there is a market for 'people' blogs, made with care and love and attention, you would be a professional without changing a thing in your blog! Maybe just remember me if you are adding some more links to your blog list! hahaha! Have a great day with that brilliant sorbet. WOW 1000!!! That means I probably missed 995 posts of yours as I recently found you. That's hard to catch up! ;-) Congratulations on this big milestone Mary! So happy for you! The sorbet is a perfect treat for yourself to celebrate this occasion. Congrats again! Congrats! Such a refreshing sorbet you have posted today. The sorbet is just perfect for celebrate and looks delicious!!! Congratulations, Mary I love your blog, and how simple and clean you make it, yet full of delicious recipes and gorgeous photos. Looking forward to the next 1000! Congrats on 1000th post, wat a fabulous number, sorbet looks fabulous and refreshing..
Wow - congratulations! Here's to many more delicious posts!! Mary,congratulations, it really is an mark to celebrate!!! I love to come here every day, even if I don't leave you a message. And the sorbet looks delicious, a very good recipe to celebrate!! Great way to celelbrate with a sorbet recipe. This one looks perfection. Congratulations! Thank you for your viists. Congrats on this huge milestone Mary and thanks for sharing so much! The Sorbet looks great, can you make this in an ice cream maker if you have one? Congratulations! The sorbet looks yummy! Congratulations Mary. What an accomplishment. I don't know how you post such wonderful recipes everyday and still find the time to visit our blogs and leave lovely comments too. You are a very special lady. I'm looking forward to your next year. Don't mess with success as they say. We like you the way you are, so don't feel like you have to change just because of the passage of time. Your sorbet photo is incredible and so is the recipe. I'll be tucking it away because it's perfect for someone like me without an ice cream maker. Maybe I'll find some wild berries so it will taste as wonderful as yours. Congratulations on 1000 posts! You are an inspiation!Keep blogging..looking forward to more great recipes from you. Strawberry sorbet looks great and delicious! Wow and congratulations! 1000 is a lot of great recipes to share! The sorbet looks so refreshing. Perfect for a warm summer evening! Thanks for sharing yet another bit of inspiration! Have a wonderful day! Congratulations, Mary! 1000 Posts is an achievement! The strawberry sorbet looks really good. It would be real soothing to have some right now, our hot weather is unbelievable! Have a nice day! Congratulations on your 1,000 posts. Your sorbet looks simple and wonderfully refreshing. But more importantly, you have created a blog that is conversational and informative. Your blog is a gem. 1000 posts and recipes is really something!! And all of them are so great - incredible! Delicioso!! y las fotos son una maravilla!! Do you understand me in spanihs? 1000 recipes! that's incredible! congratulations! A thousand posts that really is a milestone to celebrate Mary!!!!! Congratulations on 1000 posts!! I love our visits! I love Sorbet!!!!!!!!!! And strawberry is the best! Oh, Wow, Congratulations, Mary!! 1000 posts? That is incredible! And believe me when I say I am so incredibly happy that you are continuing on...I love your blog and have found so many wonderful recipes here! Thanks so much for your dedication to your blog! Congratulations! I think the simplicity of this recipe juxtaposes the enormity of your achievement quite nicely! Congratulations on your very impressive milestone. The sorbet looks beautiful and is a perfect summer treat for those of us without an ice cream maker. Woo hoo! 1000 posts! That just blows my mind :) Well done! And I think some strawberry sorbet is an incredibly appropriate way to celebrate. Congratulations! Your recipes are wonderful! "Small thoughts and tiny treasures" reminds me of a quote from Mother Theresa . . . "Small things with great love." I like it that you put so much of yourself in your posts along with great recipes. Congratulations on 300 posts. Wow. 1000 posts!?! What achievement and faithful dedication. What encouragement to us new bloggers. :) Thank you, Mary! Congrats on the posts, Mary! wow! Never made sorbet...only ice cream...looks fantastic and light! Wow!! congratulations! You've inspired me! I enjoy your blog; recipes and writing. I can't wait for my toes to curl over this sorbet! Congratulations! You are an inspiration and, like many, I thank you for sharing with us. Holy Cow! 1000 posts! You are an inspiration :) Love all your recipes and look forward to reading you each day! That's a great milestone--congrats, Mary! The strawberry sorbet looks lovely too! Congratulations! That is a great achievement, and this sorbet looks delicious! Congratulations Mary - an incredible milestone and a great reflection of your talent. Keep on cookin' OK? We love you! Felicitaciones por todos tus post son una maravilla todas tus ideas y sé que te dedicas al 100 por ciento,adoro tus recetas,cariños y abrazos. wow, congrats! that is impressive! I missed a lot of your recipes, but the ones that I've seen are delicious and inspiring. I just made this weekend Dulce de leche ice cream, after the recipe on your blog, and turned out amazing. I will post it today. Thank you for the recipe and for your inspiring work. God bless you! Happy 1000th! The sorbet looks lovely and refreshing. Congrats on the milestone, how wonderful! Congratulations on the 1000th post! You are so wonderful Mary, sharing all of your delicious recipes to us. The sorbet looks delightful. Yum. I am excited to what is to come with your recipes and beautiful pictures!! Congrats Mary on your 1000 posts, it´s a great achivement! time for a top ten posts of all time? maybe? Thanks for your sweet comment Mary :) Glad you like my blog! Yours is gorgeous, love the photography, will be perusing your recipes later! Wow Mary, congratulations! I hope there are 1000 more to come--I'll be here to read them all! Congratulations on 1,000 posts Mary!! What an accomplishment, you should be proud. Your blog is wonderful and I am so glad I found it. I look forward to reading your blog, and I love it! That is an immense milestone! I think in an era where people give up on things so quickly it's always amazing when people can stick through thick and thin with their hobbies. Impressive! Congrats! That's soooo impressive! Lot's to learn from you! Love your blog! Congratulations!! A thousand recipes is no small feat. This is definitely one to remember. The sorbet is perfect for this time of the year with lots of strawberries out there. OMG!! great achievement...Congrats....and Ya sorbet is superb..
That is truly amazing mary! SUCH an achievement! I hope there are at LEAST 1000 more! 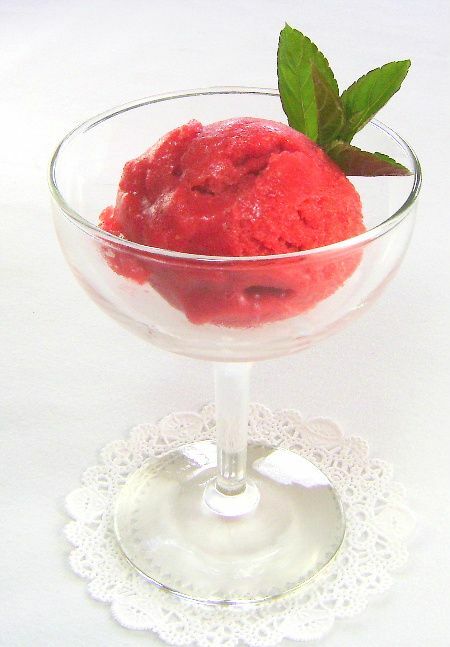 I love the simplicity of this strawberry sorbet...three ingredients? I'm so there! Happy 1000 posts! That sorbet looks just delushus and what I've determined as of last week is that I'm going to MAKE time to cook the things I've seen that I'd like to do...no more putting it off, so I especially thank you for posting this one as frozen yummies are my FAVORITE! I love the color of that sorbet! 1,000 posts is incredible! It looks delicious. And congratulations on 1,000 posts and recipes!! How wonderful! Congrats on your 1000th post! That's quite an accomplishment and you are an inspiration to me! Lovely sorbet, too! Congratulations on 1,000 posts! How exciting! This strawberry sorbet looks fantastic! Oh Mary Congratulations!! I love your blog and look forward to 1000 more posts! I am so excited about this recipe! Bookmarked it :) It is perfect for the coming months. I can't wait to try it! Congratulations on your 1000 post Mary, it is a mile stone. This strawberry sorbet looks awesome, love it as it doesn't need a ice cream maker to make. looking forward to many more tasty recipes and writeups. What a classic recipe for your 1000th post. Congratulations! I wish you all the best with the future ones :) Well done on all of your hard work! Oh wow, Mary, a huge congrats on reaching 1000 posts! You are truly a huge inspration...thanks for doing what you do and sharing your talent with us! The sorbet looks perfect -- I'm bookmarking it and plan to make it this summer! Congratulations on your 1,000 posts, Mary! Your strawberry sorbet looks absolutely delicious! WOW. Congrats! One day I hope to say the same thing. That is a huge accomplishment! Strawberries are at their peak in my area, I need to make this sorbet!! Congrats, dear Mary! I'm getting to that post, but I'm not quite there. Keep up the good work! I know it's your passion! Congrats on 1000 posts! What a milestone. Congrats Mary! You always post such delicious looking things, and I never feel like they are too difficult to try. Here's to the next 1000 posts! Congratulations Mary on such a hugh milestone. I just hit 75 and thought that was a big deal. It looks like I need to get busy! I had no idea sorbet was so simple, now I need to try it! As I get nearer to 1000 I start thinking the sane thoughts. Man it's been a long time! Yowza! Congrats on the 1000th post! Congratulations on your 1000th post - and on that delicious looking sorbet to celebrate with. You have a lovely blog. Congratulations on your big milestone!!! That is awesome! I am glad you're not changing, one of the things I love about your blog is the informal manner and your stories. Without that, I may never have started following. It makes it personal and keeps it from being just another dry recipe blog. YOUR BLUE POPPY!!!! The pictures beneath your post led me to it, I often check them out. I did a post on them once, though I have never seen one. There was one in a museum exhibit, they are rare and hard to grow. That you even found it back in the corner of a greenhouse is amazing, I SO much enjoyed the beautiful pictures!!!! I tried seeing if I could save the picture of the one big one to maybe ask you if I could use it for my desktop wallpaper, but I would have had to create a Photo Bucket account. Wow, Mary! 1,000 posts! Congratulations. And your strawberry sorbet looks fantastic. Mary, Congratulations on 1000 posts!! Love reading your recipes!! Thanks for all the inspiration that you bring with your recipes. I love the nature of your blog: your introduction, a story behind the recipe and then the recipe. This sets you apart! I bought two pints of strawberries today, now all I need is the lemon soda to make this delicious dessert! Congrats on 1000 posts!!! What a special moment! Can't wait to look through some older posts. I love your blog and hope for 1000 more recipes. Thanks for continuing to keep the world a tasty place! This looks so refreshing! Congrats on 1000 posts! That's quite an accomplishment! Cheers to the next 1000! Congratulations on the 1000 posts/recipes, and on having such a lovely blog. I'm so glad you stopped by my blog so we could discover each other. I'm following you too. Wishing you a great day and another 1000 wonderful posts. Congratulations dear Mary!!!! Yay, 1000 posts - oh my- for good most definately! That's amazing as well as this sorbet! Fantastic way to celebrate!! Hi Mary, congratulations for you wonderful blog! and for your on 1000 post! 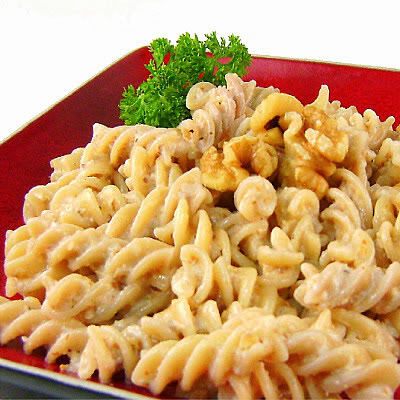 This recipe a really liked it! Congrats for your 1000 post. Strawberry Sorbet looks so great and attracttive. WOw.. congrats 1000 posts. That must be something. I completed 100 and I was on the top of the world. Completing 1000 means you have been consistent, disciplined and passinate all the same. wow 1000 posts! That's freaking awesome! cONGRATS mARY! i SO ENJOY rEADIng YOUR bLOG!!! Congratulations! 1000 post and recepies is impressive! I'm waiting for next 1000, and next 1000, and next... :) A strawberry sorbet is perfect to celebrate this occasion. I hope you'll have great day! Congratulations! I've been enjoying your posts for a while now and love your blog approach. I've also enjoyed a few of your recipes and look forward to many more!! I can see I am LATE to comment on this one Mary! Look at all of them! This is just wonderful, congrats! 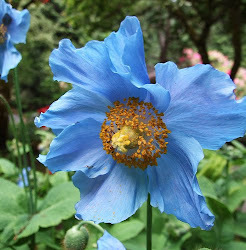 I love reading your blog and seeing its beautiful photos! Congratulations! I really like the idea of a recipe index, you have so many terrific recipes to share. I just hit 200 posts--I never thought I would even blog. I do love your blog--keep up the great work. Hi Mary, allow me to be the 143rd to congratulate you on that splendid milestone. 1000!! that is truly remarkable. I would celebrate it with that delicious looking sorbet. strawberries are soo good right now. Congratulations! That's a wonderful milestone to reach. Thanks for sharing the sorbet recipe, too - it looks fantastic. Congrats on your 1000 post, and for a lovely recipe to use up all the strawberries I plan to buy at the farmers market soon! Congratulations on 1000 posts. that is a special milestone! the sorbet looks great, so refreshing. Perfect for this time of the year. Congrats on that wonderful blogging milestone, Mary! You are truly and talented and dedicated member of the blogging and cooking world! Thank you for all you do...and all of your terrific shares! Mary- thanks for stopping by my blog. Your kind words meant so much. Congratulations on 1000+ posts! I can't wait to break out my ice cream maker and try out this recipe. The sorbet looks so good! Congratulations! That really is an extraordinary effort!